Shabbat - Dipped candles, dye-painted Challah cover, spice boxes. Rosh HaShanah - Creative Cake Cones, apple print cards. Yom Kippur - Read-aloud story, book of life scrapbook ideas, writing your own prayers. Sukkot - A suggested Sukkot Menu, collage, decorations, crayon leaf picture. Hanukkah - The Miracle Moon story, gift ideas, making your own Menorah. Tu Bishvat - Tree of life diagram, easy bake cookies, family tree project. Purim - Manot baskets, costumes, woven paper cones, puppets. Passover - The story of Egypt, Seder Plate, Matzah Pizza recipe, cartoon story. Lag B'Omer- Hats, games, egg races. Yom Ha'Atzmaut - Layered Sand Jars, flags and necklaces. Shavout - Blintzes, Yogurt Popsicles, parades, crafts and activities. Each chapter highlights a Jewish holiday and you can learn how to experience the holidays, create interesting foods and research holiday traditions. There are Read-aloud stories, traditional passages, crafts and fascinating food facts. If you have always wanted to make delicious latkes, there is a recipe. If you want to try some contemporary favorites, try the Oreo Cheesecake. Salmon Mousse with Cucumber Dressing, Homemade Hummus, Challah, Chicken Soup, Beef Tenderloin, Sour Cream Potatoes, Broccoli Soufflé and Mandel Brot all make their appearance along with a number of delicious favorites. You can also make Passover Brownies with matzo cake meal. There are diagrams you can copy and an Appendix filled with blessings. The index is excellent. This book would be perfect for teachers. 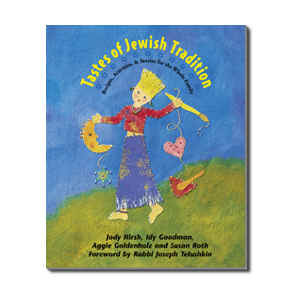 It is essential for parents and for any student of Jewish traditions. As one who learned how to make chicken soup from a Jewish friend in Seattle, I can say Jewish food has always been a favorite. I even make my own Matzo balls for soup and have mastered the making of Challah. As a child, some of my most comforting memories included eating meals at Jewish parties. I seem to remember eating the creative cake cones as a child. "Having a solid foundation, the letter beit represents a house or home. Each of us can be a home for the divine and a source of blessings to the world, making it a true home for the Divine." As you contemplate each holy letter in this book you can gain a deeper sense of purpose in the way letters are arranged to produce deeper meanings in words. "Chai, the world for `life,' is spelled with a chet and yud. This combination unites the presence of G-d (represented by the yud) to our existence in time (chet)." The drawings themselves are alive with meaning and beauty. I love the drawing "Ahava" because two hearts are incorporated into the picture to produce a stained-glass effect. The "Tikkun Olam" painting would be beautiful framed.